It’s not looking like a pretty morning for equity bulls today, but with the DJIA futures indicating an opening decline of just over 200 points, things look a lot better than they did a few hours ago. As always when the market’s get into one of their moods, things tend to move in fits and starts before calming down, so expect to see some violent swings throughout the day. The opening bell is only an hour away, but we could just as easily see an up open when the bell rings as we could see a down 400+ open. 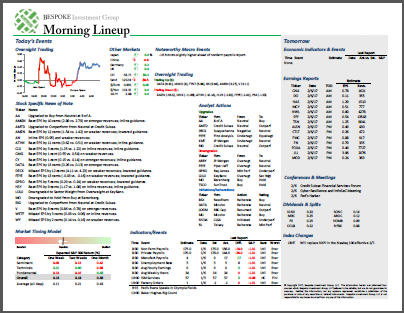 In the big picture, while today’s early weakness is disappointing, positive futures following a day like yesterday are often met with selling. In today’s Chart of the Day, which was just sent out a short time ago, we looked at S&P 500 performance figures following 3% down days. Be sure to check it out. Yesterday’s fifth straight day of declines has really moved the S&P 500, most of its sectors, and a lot of stocks into oversold territory. 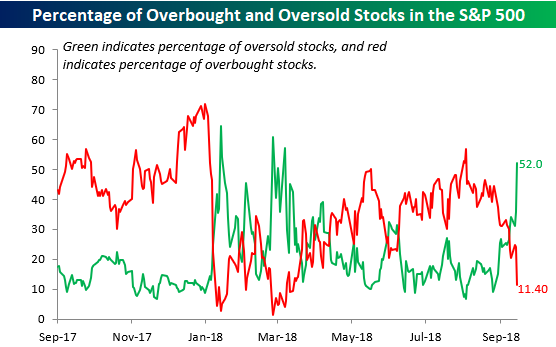 Among individual S&P 500 stocks, more than half (52%) are now trading more than one standard deviation below their 50-DMA, which is the highest reading in over six months. 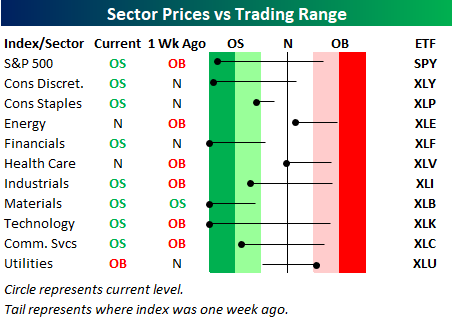 Among the S&P 500’s major sectors, just three (Energy, Health Care, and Utilities) are not oversold and three (Financials, Materials, and Technology) are trading more than three standard deviations below their 50-day moving average- a level that we would unscientifically call ‘waayyy’ oversold. The S&P 500 is also trading at oversold levels, but still hasn’t quite reached those ‘waayyy’ oversold levels.